The Compulsive Reader: Runaway, Meg Cabot, and Buffy the Vampire Slayer, Oh My! Runaway, Meg Cabot, and Buffy the Vampire Slayer, Oh My! I'm glad you found your way to my blog for Meg Cabot's blog tour to celebrate the release of Runaway , the final book in the Airhead trilogy! You can read my review here. It's a fabulous book, so be sure to pick up a copy! I've been reading Meg's books for so long now, I know I can trust her to come up with smart, entertaining, and humorous books that I will devour. My first encounter with a Meg Cabot book occurred in sixth grade, in the girls’ locker room right before gym class. Being the bookish kid I was, I predictably hated changing in front of all the other girls and usually rushed through the process, staring intently into my lurid orange locker. But on that early spring day, one thing slowed me down, and that was the conversation going on between the eighth grade girls. To say I was eavesdropping would have been inappropriate as it was nigh impossible to do anything silently in that tiny, completely tiled-in room…but I was hanging on every word they said nonetheless. It was a copy of Meg Cabot’s All-American Girl that one eighth grader was waving around and lending to all of her friends. The cover was blue, with what looked like fireworks on the front, and it was thick…far thicker than any book a casual reader would pick up. I was the Reader of the school. I was the one who had already blown through the school’s measly library. I was the one who set the school record for reading points two years previously. I was the one who knew everything there was to know about every book that everyone in the school liked. So how, I asked myself, could I not have heard of this amazing book? There was one thing I knew at eleven years old, and that was if a book was thick and even reluctant readers were raving about it, then it must be good. So, I was faced with a dilemma: my curious and bookish nature would not allow me to leave the locker room without finding out more about that book. However…talk to eighth grade girls? When they hadn’t spoken to me first? I couldn’t actually do that, right? But as the girls slowly filed out of the locker room, one by one, I saw my opportunity slipping out the door with them. Keeping my eye on Andrea, the girl with the book, I forced myself to face the facts: either confront her and risk being belittled, or lose out on finding out more about the book. And surprisingly, Andrea was very cool. She showed me the book, and even let me borrow it the next day. And I fell into Meg Cabot’s world. All-American Girl was everything I wanted in a book, but hadn’t been able to find in between the dusty classics and simplistic chapter books gracing the shelves available to me. Her characters were smart, strong, and funny. They were everything I wanted to be. I hadn’t figured out how to get there, but those characters slowly helped me achieve the confidence and independence to find my way. In addition, her books were the first I had read that used pop culture references. I got ridiculously overexcited when I read about Sam talking about Buffy the Vampire Slayer…up until that point, I hadn’t even realized Buffy was popular, or that teenage girls openly watched that show (unlike me…I watched it in secret whenever I could). It was then that it hit me. An author who wrote funny stories, so implausible that they were halfway believable, had romance, and Buffy the Vampire Slayer…I was enamored. This Meg Cabot had to be sent to me from God. And it sure continued to seem that way: Meg Cabot led me to the previously undiscovered YA section at my library where I fell in love with more fantastic books, to a future best friend named Andrea, and inspired me to write my own words and find who I am. To which I said, and still say, THANK YOU, MEG CABOT! Now, please go and pick up a copy of Runaway today! And be sure to stop by Meg's Scholastic site! Join Runaway author Meg Cabot and Thea and Ana of The Book Smugglers for a Twitter party Thursday, April 22, between 8:30 and 10:30 p.m. EST! 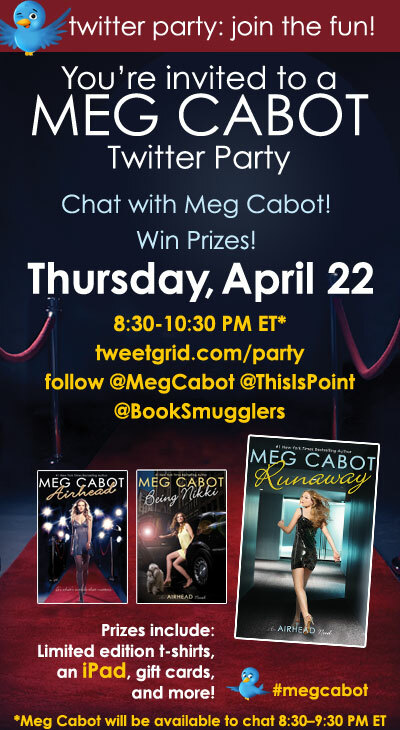 Be sure to follow Meg @MegCabot , Point at @ThisIsPoint, and Thea and Ana @BookSmugglers before the party! Join the fun! No one expects you or your tweets to be perfect; we’re just happy you made it to the party! Anyone who tweets during the party using #MegCabot is entered to win a limited edition Runaway t-shirt – featuring the winning design voted for by fans! Watch for questions from @BookSmugglers and win awesome prizes including an iPad, $50 Sephora gift cards or $25 VISA gift cards! 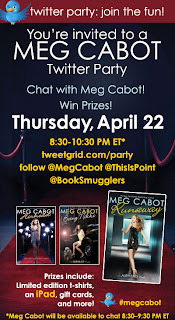 To join the party, you can use our official party tweetgrid or just search #MegCabot on Twitter. Please don’t post any spoilers and don’t forget to pay attention to the time zones, the party starts at 8:30pm EST. OMG! I remember reading one of Meg Cabot's books and being so excited over the mention of Buffy. I'm a 16 year old girl how has watched the entire series of Buffy at least twice, and my friends think I'm a freak. This post was about two of my favorite things, thank ya! What a story...and how relatable. I was/am the Reader, and adore Buffy. Luckily, I've found some others who agree with such tendancies. I haven't read All-American Girl, but the Mediator series=love. It's practically Buffy with ghosts! I don't Twitter, but the party sounds awesome. Have fun! Heh. My first Cabot encounter was when the first Princess Diaries movie came out. I saw the movie and loved it (not realizing it was a book, otherwise I would have done my ritualistic read the book before the movie) and picked up the first Princess Diaries book. While I was rather shocked at how different it was from the film, I adored it even more and have been a confirmed Cabot-holic ever since. 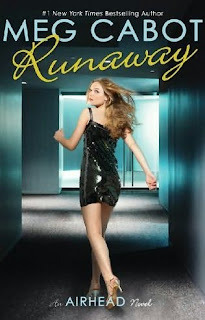 I shall be reading Runaway after I get my copy of Being Nikki. Also, I too, adore Buffy. Interesting perspective on pop cultural references. I always think about how they will sound in ten years, but there is something to be said for speaking to students at the moment. Hmmm. This post was so adorable, I love these kinds of things, personal stories and such which pertain to books. Something Like Fate Blog Tour! This Is Me From Now On Contest! Win a Copy of Morpheus Road: The Light! Show Suzanne Collins Some Love! Cover Talk: Oh, No They Didn't!